Should I be concerned about Dirty Electricity in my home? Got any of the health symptoms in the list below? 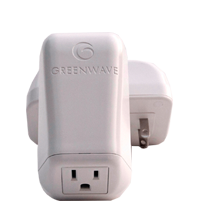 Greenwave filters remove or reduce high-frequency pollutants on the electrical wiring in your home or business and are widely trusted around the world as one of the key solutions in reducing harmful EMF in homes and offices. We sell and install GREENWAVE filters and do EMF home inspections in Toronto Ontario, Chicago, Illinois, and surrounding areas. What are Greenwave Dirty Electricity Filters and how can they benefit my health. Dirty Electricity filters remove electromagnetic interference (EMI) and dirty power from home or office wiring, thus reducing harmful electromagnetic fields (EMF). Dirty electricity is found in a range of frequencies. A filter must have filtration capabilities that target both high and low sections of the frequency spectrum. Both Graham Stetzer (Stetzerizer) filters and Greenwave filters do this. Here we discuss Greenwave. Greenwave® dirty electricity filters target the broad range of frequencies that can contribute to health issues. We’ve tested these filters in the field and have concluded that they provide optimal levels of dirty electricity (EMI) reduction. Greenwave filters remove erratic micro-surges of energy from wiring, helping to normalize electrical current, and thus reducing health risks. COST: A 2 bedroom home kit costs US $336. Other package deals available. BUILT-IN OUTLET: Greenwave filters have a built-in outlet at the base of the filter, Stetzerizers do not. Thus with Greenwave, you don’t lose the use of an outlet. CAN STOP EMI AT THE SOURCE: Greenwave filters reduce dirty electricity traveling along electrical wiring in a building. They can also help stop dirty electricity at its sources, that is, the electronics and other electrical equipment that create it. When you plug a device into the base of a Greenwave filter rather than directly into a wall outlet, dirty electricity created by the device will be filtered before it reaches the internal wiring of the building. Conclusion: Greenwave filters are an excellent way to reduce dirty electricity in your home or office. They absorb and dissipate the dirty electricity, reducing dangerous electromagnetic energy by 50 to 95%. Our research has concluded that Greenwave represents the optimal design, so that’s the one we recommend. I usually install 12-20 filters in a home, depending on size. I measure each outlet and then place the filters strategically and they work together to harmonize the home into a cleaner electrical state. Rule of thumb: Two Greenwave filters are needed to reduce dirty electricity in an average room. Rooms with concentrations of electronics may require more than two filters (usually 3), while smaller rooms, such as bathrooms and laundry rooms, usually require only one. I’ll help you install Greenwave filters as part of my EMF Housecheck inspection.